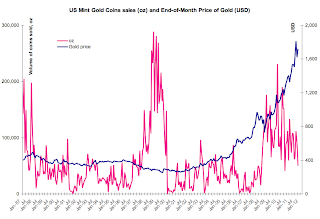 In recent weeks there was some long-expected noises coming out of the gold 'bears' quick to pounce on the allegedly 'collapsing' sales of gold coins by the US mint. I resisted the temptation to make premature conclusions until the full monthly sales data for October is in. At last, we now can make some analytical observations. 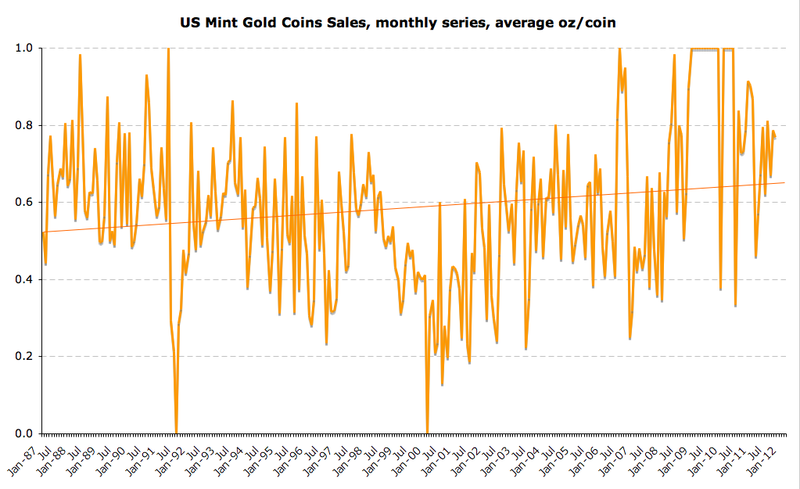 In absolute terms, number of coins sold by the US Mint in October has fallen to 65,000 from 115,500 in September. Mom, thus, volume of sales, measured in the number of coins is down 43.7% and yoy change is -45.6%. Significant declines. Latest sales are running below the historical trend and 6mo MA has hit the long term historical trendline. This suggests reversion to historical mean, as predicted by my previous note on this matter and is, in my view, a welcome sign of some 'froth' reduction in the speculative component of the market. The trend remains on the upside, and 6mo MA is still running ahead of pre-crisis averages. Historical average is at 98,329 coins with a massive standard deviation of 112,309. Crisis period average is 128,967 and smaller (but still substantial) standard deviation of 110,323. Now, for 10 months of 2011 so far, the average is 130,400 coins sold, but the standard deviation (imprecise estimate, of course) of 41,934 or roughly 1/3 of the volatility over entire history. Thus, if anything, monthly movements along the elevated average trend for crisis period are now looking less volatile than in pre-crisis period, which suggests that gold is acting as a hedge during the crisis against prolonged risks in other asset classes and that this property is so far being reinforced by reduced volatility as well. 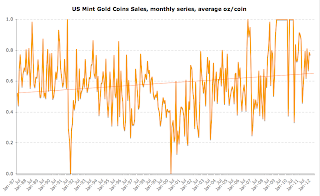 Chart above shows that when it comes to gold coinage sales in volume (oz) of gold content, October sales (50,000 oz) are well below September sales (91,000 oz) and are 46.8% behind October 2010 sales. Worried 'bears' are onto something here? Well, not exactly. 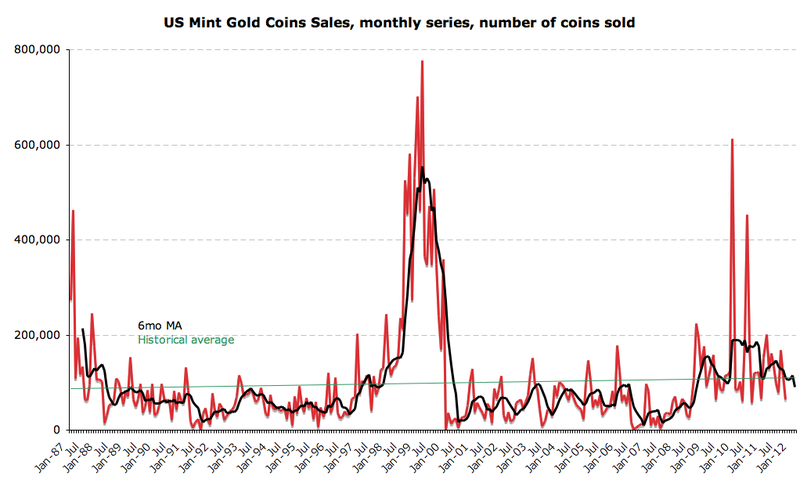 As with coinage, volatility of the series historically runs at 52,985 against historical average sales of 55,768 oz. Crisis-period volatility is at 44,726 against crisis-period average sales of 95,859 oz. 10mo through october 2011 volatility is at 26,514 (1/2 of historical volatility) and average sales are 89,350 oz - below crisis period average. Again, there seems to be more stability in sales in terms of oz volume than before, which, surely, should be a good thing for a hedge instrument. The 6mo MA trend is on decline here since March-May 2011 and, again, this is not a bad thing, as it signals continued reversion to 'normal' trading conditions - i.e. potential reduction in speculative buying. Next little thingy, volume of gold per coin sold on average now stands at 0.769 oz/coin in October, virtually bang on with September 0.788 oz/coin. Which too is a good thing. 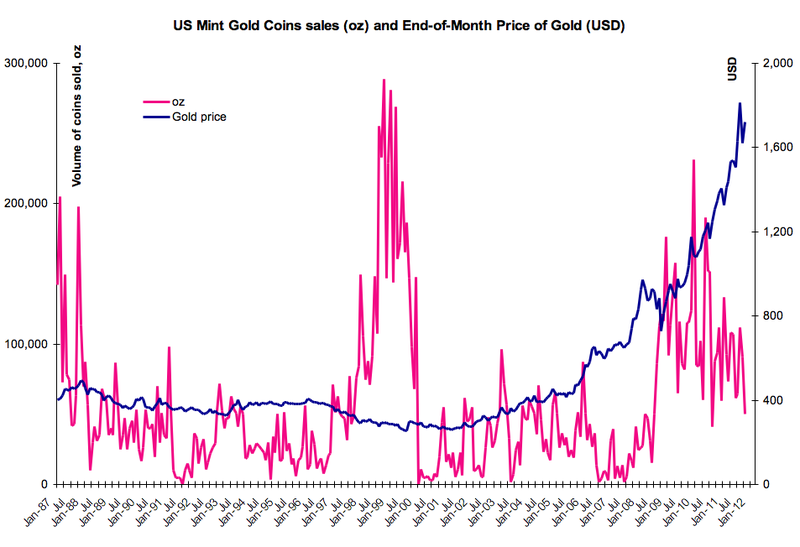 Average historical volume of gold per coin sold is 0.587 oz/coin (stdev of 0.2) and crisis-period average is 0.816 oz/coin (stdev of 0.191). Latest 10 months period average is 0.703 oz/coin (note - we are still well ahead of that in October) and stdev for the period is 0.126 - well below historical volatility. So no drama - in fact, much less drama - in October data. Upward trends remain, reversion to trend is ongoing nicely, volatility falling. I never make predictions about bubbles timing, but as far as 'bursting' explosions and profound changes - I don't really see them. At least not yet. 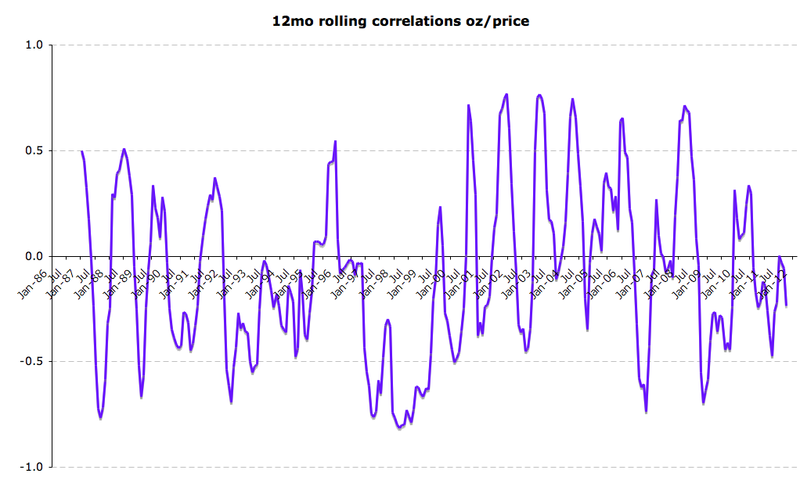 Thus, in October, 12mo dynamic correlation has fallen to -0.24 from -0.06 in September. This looks dramatic, until we consider historical trends. Average historical correlation is at -0.09 with stdev of 0.397. Crisis period correlation averages at -0.151 with a standard deviation of 0.377. For the period of January 2011-October 2011, average correlation is at -0.205 and stdev at 0.151. 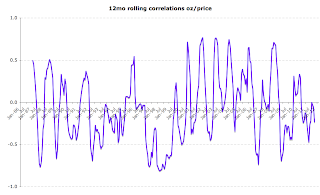 The above implies that while current negative correlation is not dramatic, the trend in 2011 is so far distinctly for deeper negative correlations between gold price and coins sales and for more stability along this trend line. Is this a good thing? Nope. The opposite is true in my opinion. More negative correlation implies stronger reduction in speculative buying, leaving gold coins demand more dependent on long term hedging objectives and as the tool for preservation of wealth. In other words, less speculation, more long term demand. This is not what we should see in a bubble 'bursting' stages. Once again, caution is due - I am not arguing if there is a bubble in gold markets overall. This is just analysis of the coins sales. I am simply suggesting that we are seeing a well-predicted reversion to the mean along upward trend in demand. We are also seeing, in my opinion, gold coins doing exactly what gold in general is expected to do - providing long term hedge instrument against risks associated with other asset classes. Disclosure: I serve as non-executive member of the Investment Committee of GoldCore and I am long gold with stable unchanged allocation over the last 3 years. All of the above views are solely my own. very good and informative blog. 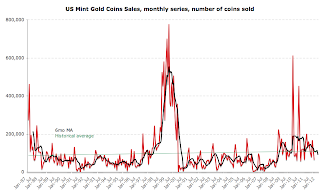 "Collapsing" of gold coins sold on the U.S. Mint. Shows that U.S. investors are buying other investment products where higher profit margins. Ordinary people are displaced from the gold market, because gold is too expensive. Due to decreasing salaries and increasing the cost of living. I have one question. Do you think that demand from China and India play a greater role in the gold price, with 2 billion people? 23/11/2011: Is there a run on the euro?